Psychic phenomena and special sense development is due to the stimulation of a chakra by concentration of mind energy or interest in its function. Animals depend on the keenness of one sense for their direction and safety. The two petaled center in the forehead is the seat of consciousness in the brain. It descends as a dual current in a serpentine twisting motion polarizing and depolarizing in each center of the five etheric fields. Mind and prana (life breath) function thru [through] the fields of matter and its centers. 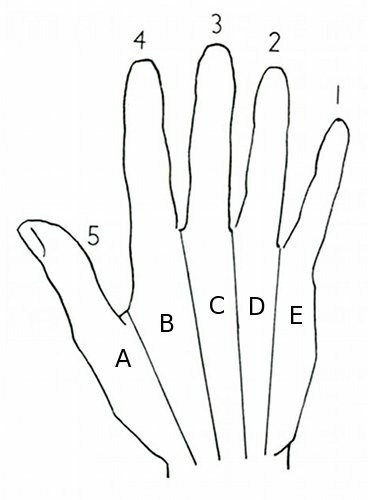 The hand is the same functional neuter [neutral] pole as the foot is the negative pole. Chart No. 4 gives definite regional anatomical locations for affecting structural changes by manipulation or pressure on definite reflex areas. 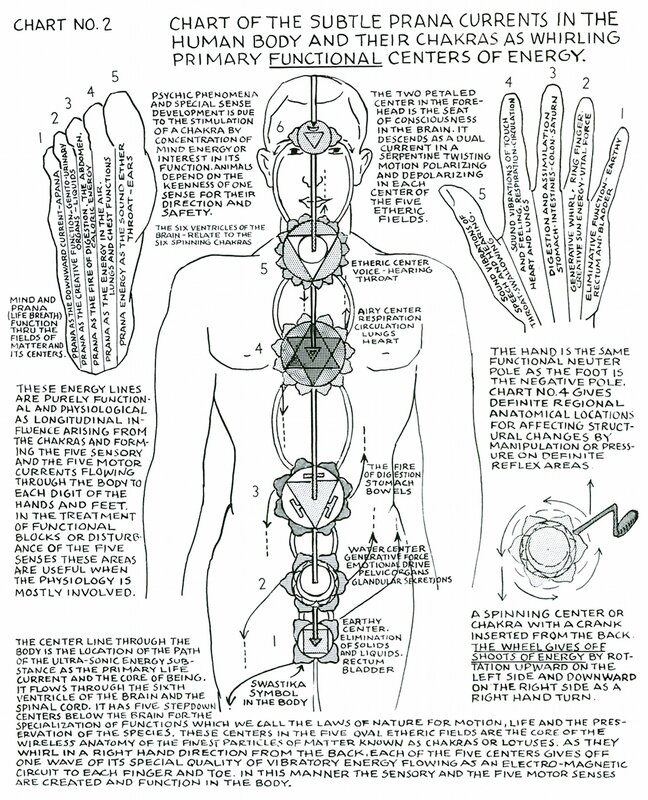 These energy lines are purely functional and physiological as longitudinal influence arising from the chakras and forming the five sensory and the five motor currents flowing through the body to each digit of the hands and feet. In the treatment of functional blocks or disturbance of the five senses these areas are useful when the physiology is mostly involved. 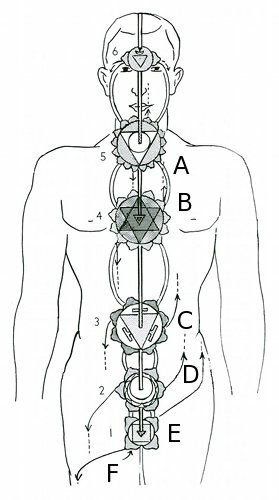 The center line through the body is the location of the path of the ultra-sonic [ultrasonic] energy substance as the primary life current and the core of being. It flows through the sixth ventricle of the brain and the spinal cord. It has five stepdown centers below the brain for the specialization of functions which we call the laws of nature for motion, life and the preservation of the species. These centers in the five oval etheric fields are the core of the wireless anatomy of the finest particles of matter known as chakras or lotuses. 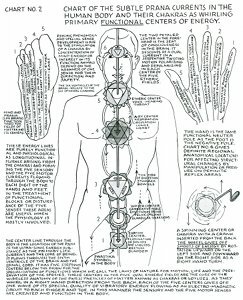 As they whirl in a right hand direction from the back, each of the five centers gives off one wave of its special quality of vibratory energy flowing as an electro-magnetic [electromagnetic] circuit to each finger and toe. In this manner the sensory and the five motor senses are created and function in the body. 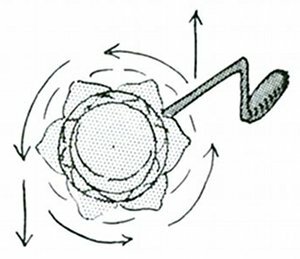 A spinning center or chakra with a crank inserted from the back. The wheel gives off shoots of energy by rotation upward on the left side and downward on the right side as a right hand turn.